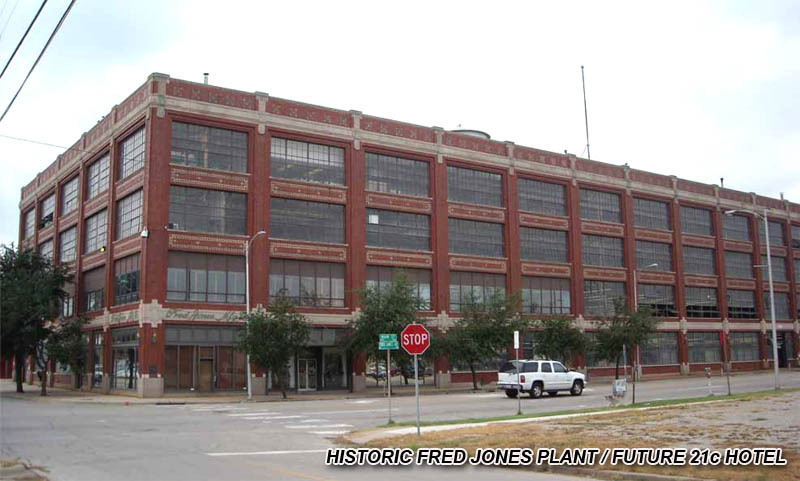 As has been discussed in the 21c Museum Hotel thread, the Hall family will retain ownership of the old Fred Jones plant that the hotel will occupy and be a partner in that $51.5 million project. Hall Capital also owns quite a bit of land around 21c and has ambitious plans for development. Hall owns property on 5 blocks around the hotel and the current plans call for 4-story apartments on all of them with structured parking and commercial/retail on the ground floor along all the street frontage. The one exception will be Block 3 which will be a small number of for-sale units at 2 or 3 stories with private garages. All existing structures will be demolished except for the plant itself and two small red brick buildings at the northwest intersection of Sheridan and Fred Jones. 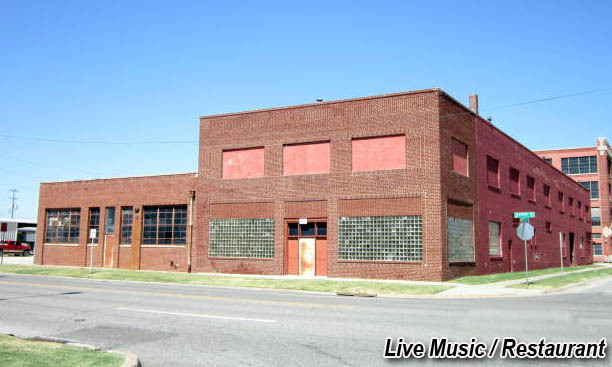 These structures were built in 1930 and will become a live music hall and restaurant and the one-story building to the west will feature a rooftop patio. We first reported this in a post on March 17th. Hall is partnering with a master developer who is turn seeking other local developers to help develop the various blocks, all within a certain design and conceptual framework. I know Andy Burnett is involved and possibly Mark Beffort, David Wanzer and Ben Sellers, as well as others. Current plans call for approximately 200 living units, considerable commercial space and structured parking for residents, hotel guests and patrons of the various establishments. 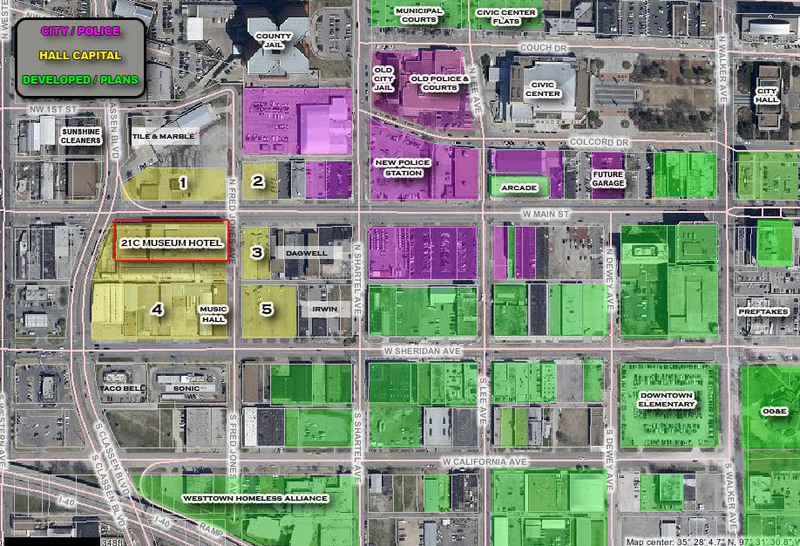 Effectively, all five blocks would be covered with dense development pushed to all the property lines. The parties involved are still in various active negotiations, including with the City to arrange for public incentives. However, it is my understanding things are looking very solid and an official announcement should be coming soon. Sounds pretty damn amazing. If this comes to fruition as described, this will be a MASSIVE boost to the west side of downtown development. I think this could be exactly what downtown needs to begin bridging Film Row, CBD, and Bricktown/Deep Deuce. The big unknown is all the surface lots between this project and the CBD. I know the Police are working to build one smallish parking structure (as labeled in the graphic above) but that still leaves most of Main with tons of nothingness. I hope some substantial plans are in the works but I haven't heard of anything definite. Also, the properties labeled 'Irwin' above are critical to linking Film Row to this development. I know Chip Fudge really wants to buy them but thus far the owner has been unwilling. It now makes sense why the 21c hotel would be built where it is being built. 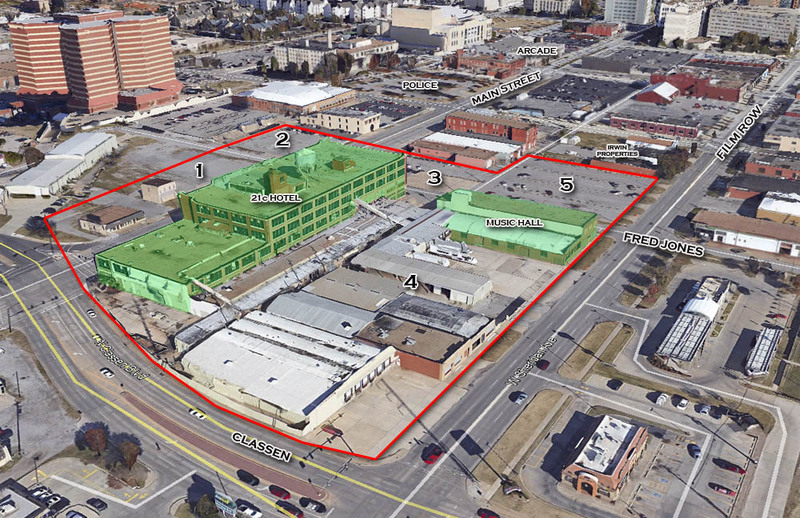 A lot of people were concerned about its location off the beaten path, but if all this gets developed as described here, that area could easily become a major focal point for downtown OKC. Kind of surprised the estimate for living is around 200 units. With this many blocks I would think it should be more. They must be leaning to more office and retail space. Will only be 3 levels of living (ground floor is either parking or commercial) and they also have to accommodate parking not only for the residents but for the hotel, Music Hall and all the commercial space. All that parking will be wrapped in living or commercial. By way of comparison, LIFT is 327 units and is taking a full, square block. It's 5 levels, all living units with just a small amount of commercial, and they only have to park their residents. I hope the design of the new buildings is similar to that of the old factory. It's a cool look and it would really give that end of downtown a distinctive appearance. I am impressed by the overall development concept, I just hope that the south parcels on Sheridan are developed after the north parcels on Main. Film Row may soon develop an architectural form identity with restored brick warehouse buildings in 2 years, which may not be as noticeable today. That surface lot at Main and Lee needs to be developed before those buildings go. I'm cool with a slower process of development. I love to see infill but it needs to be "best use" type infill. We do need more residential in Film Row and everywhere else in the inner city, from Bricktown, to Midtown, to Film Row, to Automobile Alley, all the way up to Paseo and Uptown 23rd. This seems pretty huge. What is the likelihood they pull this off? The thing about residential is that if it's incorporated with most concepts outside of the CBD, it takes care of itself. You don't need 327 unit complexes. You need a building to have 2 or 3 levels of residential generally existing above the street level with the street level being occupied by some sort of commercial space, whether it's rent or condo/flat. Still really waiting for a developer to get away from the big complex and focus more on multiple buildings per block and this seems like an excellent time to do that. And if not legitimate individual buildings, at least some buildings that are tastefully done so as to appear to be different buildings. I've always wanted to see residential in Film Row and recently stated that in another thread. This is a step in the right direction. This will bring pedestrian traffic to this area as never seen before. I'm excited and hope we see it come to reality. I was told that it's going to happen and they want to start relatively soon. But of course, still need to work through the incentives, design approval and building permits. Pete, any idea what we are talking total numbers wise when it comes to this and 21c? Would $200 million be close? No, I think $200 million is way too high. LIFT at 329 units, garage and some retail is $42.5 million. Level was only $24 million. I've heard this project will be more than 21c ($51.5 million) but I wouldn't expect it to be much more than that. Best guess: $50 to $70 million. I've always thought this area of the core had great potential, but there are two elephants in the living room: the County Jail and the homeless shelter. Not to sound insensitive, but I've lived in a lot of big cities and have seen how these impede development. It is hard to sell condos to yuppies if they're located in areas such as this. Will these structures be relocated? Depends on how the homeless shelter is run, but it is estimated that there are over 1000 homeless is downtown San Diego with several shelters offering day and extend residency to them, and they seem to co-exist with lots of residential projects side by side. Any status updates on this? They've been gutting out the interior for the last few weeks. I can't imagine too much in there to gut, as it's a fairly open warehouse. This is separate from the 21 Hotel. well, technically it is the same developer therefore the same project, although I can see where you're coming from. I think the question we need to be asking ourselves here is: what is time. If you were alive in the early 50's, you'd be supraised to learn your are, in fact, a four dimensional character. Assuming I moved from point a to point b, you might say I used to be in another place which would imply past tense and therefore there would be a separation of present and past, but you can't prove that. Not even video evidence could really prove anything because we're in the present in our place. Do the math man. Albert Einstein was wrong about one thing; there could be an alternate universe for every second and thereafter at all times for infinity and beyond(that's right I went Buzzlightyear on you deal with it) always creating new universes for every second that passes for every possible outcome there could ever be. That includes me the in a town called Cougar Town, oh wait, they already have that, but this is their last season!!!! no matter, alternate universes take care of that and so does the Friends bar which I've been going to multiple times a week because it's such a nice bar. They originally had ambitious plans for the area surrounding the hotel but I am wondering if those plans are still a go in light of lower oil prices. It's pretty unlikely that oil prices would have any effect on this project. First of all, the Halls' portfolio is not very energy-heavy, and secondly the development of the outlying buildings is probably somewhat critical to the success of 21c. Let me say this about oil price and OKC development. Sprawls is built on debt and surplus money. When times get financially lean urban density is the cure. The reason OKC fares so poorly when oil prices go down is because the local economy is built on $100 oil. If the so-called corporate visionaries in OKC would exercise a little thrift and good development patterns in the good times the bad times wouldn't get so bad. The Burger Capital of US, OKC? Venture Capital for Mr. P(runepicker), Et. Al.